Clean room? Check. Comfy bed? Check. Decent breakfast? Check. In a good spot? Check. Great for our budget? Check. 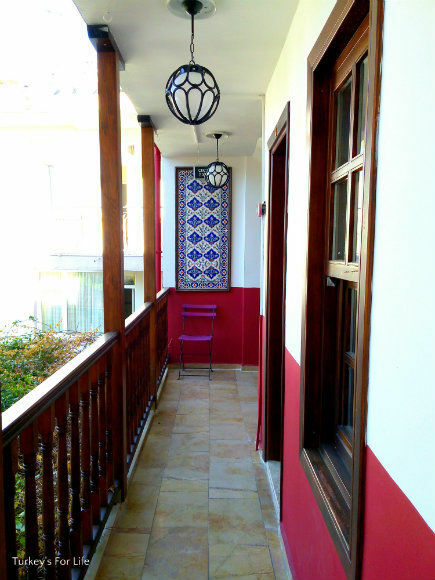 Yeah, these are all the things we look for when we’re booking our digs for any little jaunt we do and Dantel Pension in Antalya’s old town, Kaleiçi, ticked all of our boxes. Whenever we go to Antalya, we like to stay in Kaleiçi. And in the past, you might remember we’ve stayed at the top end of the old town at Otel Twenty. Well, this year, we thought we’d break with tradition and have a complete change. Well, we don’t want to be getting stuck in our ways, now, do we? A quick scan through hotels in Antalya and Dantel Pension looked like a decent option. The photos showed a traditional building with courtyard and homely rooms. The map showed us that Dantel Pension is just a short stroll to beautiful Karaalioğlu Park and the heart of the old town, too, with all its bars and eateries. Perfect! Because, these days, there’s something you’ve got to watch out for when booking places to stay in this area. As more and more restoration takes place there are swanky boutique hotels and hostels galore…and there are also bars and eateries galore. Everyone is sharing the same space and, for some, their room can get a tad noisy as diners and drinkers return home. 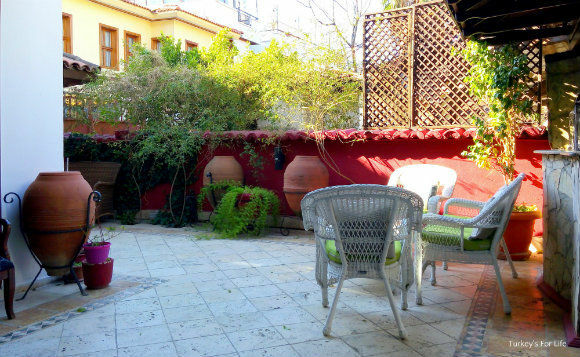 We didn’t know when we booked it, but Dantel Pension is tucked away on a lovely quiet street. The only noise through the night was a couple of local tom cats trying to claim their territory. 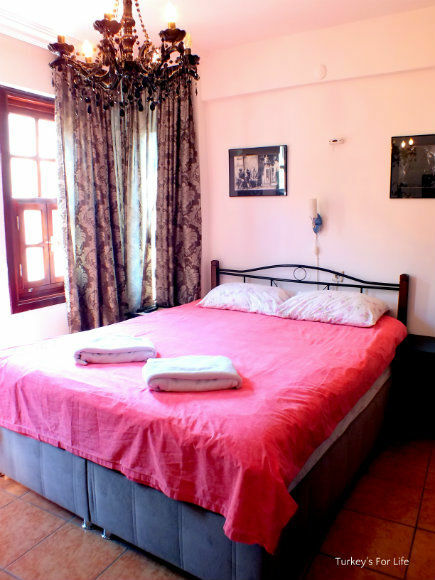 There’s nothing sleek and modern about the rooms at Dantel Pension, as you can see in the photo. But we were really settled there – so much so that the three night stay we’d booked became a five night stay. The room had a good wifi connection (very important for these two bloggers/social media addicts), we had a TV (the music channel wasn’t bad), coffee table, comfortable armchair (that of course became a dumping ground for bags and clothing) and a double wardrobe. 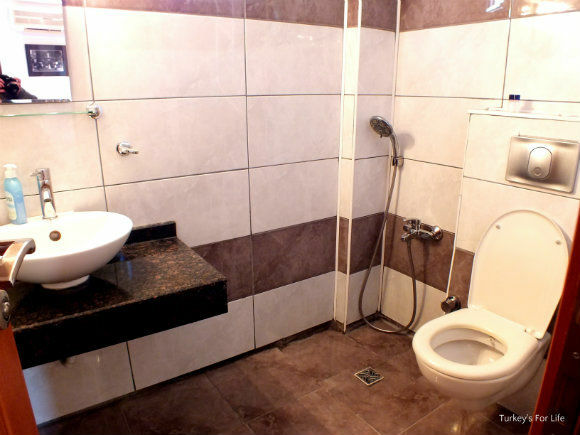 The en suite bathrooms at Dantel Pension are typical of those of other pensions – a wet room. The clever thing about these bathrooms, however, is the floor of the shower area is set an inch or so lower than the rest of the bathroom. If you’re familiar with this type of bathroom, you’ll know this is a great idea because it means the whole floor doesn’t end up swimming with water which you then walk into the bedroom! Hot water was available all day – always helpful when you’re in Antalya to take part in Runatolia! A hot shower afterwards is, of course, much appreciated. We will say, we were happy with our water pressure – certainly no power shower but it did the trick. Our friend was in the room next door, though, and she said she would have preferred a bit more pressure. So, on that score, guess it depends what you’re used to. Our own water pressure at home isn’t the best so maybe we don’t notice these things as much. The owners at Dantel are really friendly. There was only our friend and ourselves staying there in early March so we got the opportunity to have quick chats with them over breakfast. They’ve been running this cute little hotel for 13 years and it shows. It feels ‘lived in.’ Everything is freshly painted, varnished and super clean but the personality of the owners is there, too, and they make you feel right at home. Breakfast was a help-yourself set up. In summer, this little communal area has chairs and tables and the buffet breakfast is set out here, too. As we’d only just left winter behind, breakfast was set out for us in the kitchen area but it was still warm enough for us to sit outside at the large tables made from old doors. (We love us a table made from an old wooden door). Yoghurt, fruit and cereal accompanied the usual array of Turkish breakfast staples: A couple of cheeses, salami, tomatoes, cucumber, olives, honey and various jams. And each morning, we were offered an omelette. Just a lovely little extra treat. Our friend and Barry are also keen coffee drinkers so they apprecieated the never ending supply of filter coffee, too. Çay was my breakfast tipple. And there is just such a pretty entrance and exit at Dantel Pension. Through those doors, you’re straight onto the quiet side street that will lead you to the seafront and down to Antalya’s ancient harbour. From there, you can do a boat trip or take the glass lift back up to street level. And, if you want to go further afield, you can jump on the tram to ancient Perge or arrange a day trip via the owners of Dantel Pension. 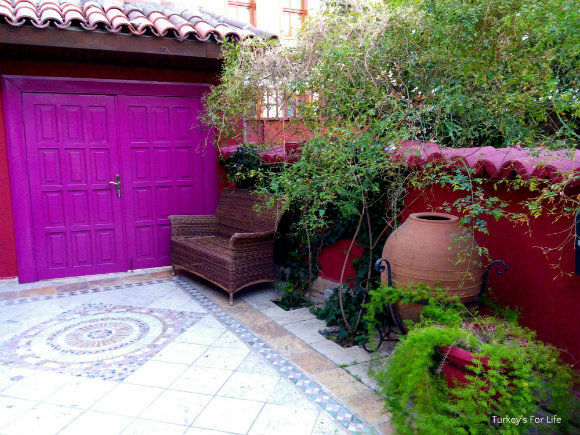 Dantel Pension is in the old town of Antalya, Kaleiçi, just off Zeytin Geçidi. The pension is open year round. Dantel Pension’s central location makes it ideal for getting around. You can also book day trips directly with the pension. If you arrive in Antalya by bus or plane, you can take the Antray tram and get off at Kaleiçi. I’d much rather stay in a pretty pansiyon than a hotel – one for the notebook. good one for the list – next time? Are you an Antalya fan then, Alan? 🙂 Dantel Pension might just be quiet enough for you. Not a lot of street noise. Booking.com is BANNED in Turkey….so cannot see details. How much does it cost? Thanks to you both, I just reserved for three nights in October at Dantel as I will be in Fethiye alone for one month and want to visit Antalya. Also reserved thanks to you at Olive in Kabrak for one night in their bungalow. Hopefully, we will meet at Blue bar as I will stay almost next door to it near the bank. My small Yorkie Mini has passed away 2 years ago so I will be on my own this time around but getting a puppy Biewer in November upon my return to Montréal. Sorry to hear about your lovely little dog – but also happy times ahead if you’re getting a new puppy once you get back from Turkey.